Confederacy, Charleston S.C. May 6 186, cds with matching large "10" due rating handstamp (CSA type K) on adversity cover made from printed form to Laurens Hill Ga., manuscript soldier's endorsement of the 6th Ga. Regiment at top left, pencil "Misst & Ford" rating and "Lawrence Ville Ga. May 11" cds adjacent; light diagonal fold, Very Fine, ex-Karrer. A SCARCE MISSENT AND FORWARDED SMALL GEORGIA TOWN USE. Confederacy, Charleston S.C. Dec 16, cds with matching large "10" due rating handstamp (CSA type K) obliterated by circular grid handstamps and re-rated with large "2" due rating handstamp (CSA type H) for the drop letter rate, on homemade brown cover to local military address of Lt. E. J. Gregory, Co. G or H, 6 Va. Regt., manuscript "Telegram" endorsement at top, fresh and Very Fine, ex-Kohn, Karrer. 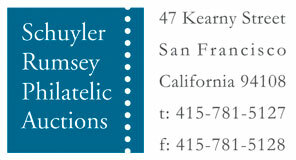 THE LISTING AND ONLY RECORDED EXAMPLE OF THIS RE-RATED DROP LETTER USE. 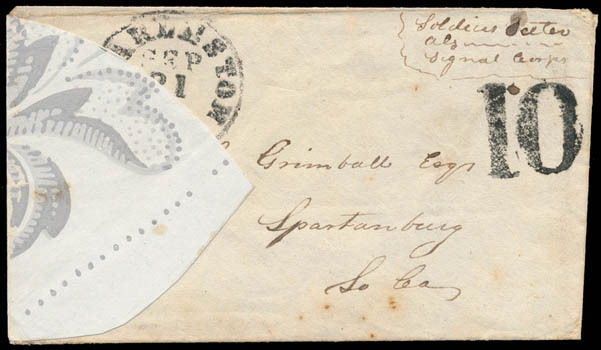 Confederacy, Charleston S.C. Sep 21 186, cds with matching large "10" due rating handstamp on wallpaper cover with silver gray and white floral pattern from the well-known Grimball Correspondence addressed to J. B. Grimball Esqr. 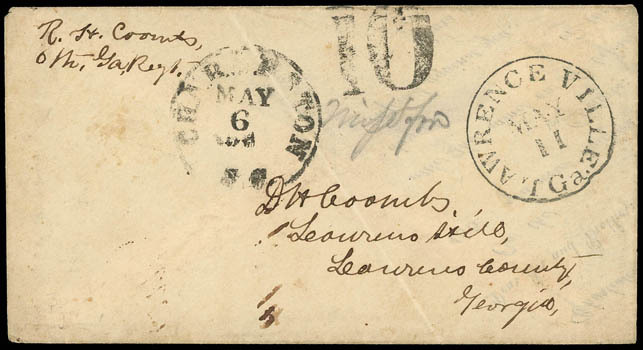 in Spartanburg C.H., S.C., soldier's endorsement "Soldiers Letter, Signal Corps" upper right, 1864 docketing, flap folded out for display, Very Fine, A beautiful silver and white floral pattern wallpaper cover, ex-Lemley, Karrer. 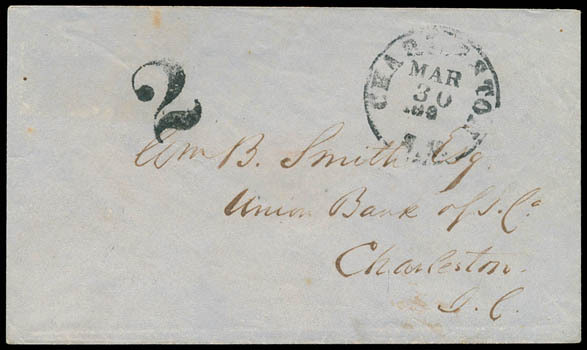 Confederacy, Charleston S.C. Dec 2 1862, cds on small salmon cover addressed to W. D. Mitchell, Lt. Col. 29th Regt. Ga. Vol., Savannah Ga., unusual endorsement "A.C. Lee, Rebel Troops" at upper left, unusual sequence of rate markings including Charleston "Paid 10" circled rate handstamp (CSA type G) overstruck with bold large "10" due rating handstamp (CSA type K), small red "10" rating handstamp cross out in pencil and red crayon "2" at bottom, Jan. 1863 answer docketing at left, reverse with ½" x 1" rectangular mucilage stain over backflaps possibly from an express label, Very Fine, ex-Emerson, Everett, Karrer. 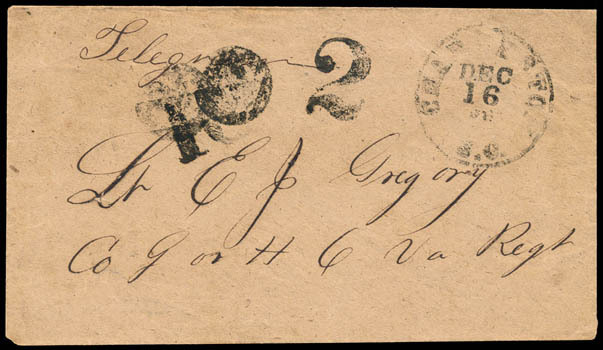 AN ATTRACTIVE AND INTERESTING COVER BEING THE LISTING EXAMPLE WITH THIS COMBINATION OF RATE MARKINGS. Confederacy, Charleston S.C. Mar 30 186, cds with matching bold large "2" rating handstamp (CSA type H) on drop cover to local civilian address in violation of the rules; but of flap missing, clean and Very Fine, ex-Karrer. Apparently Postmaster Huger let some unpaid mail to commercial customers like the Union Bank of S.C. pass after they had set up charge accounts.